Tennessee Williams collaborated with Oscar Saul and Elia Kazan on the screenplay. Kazan, who directed the Broadway stage production, also directed the black and white film. Marlon Brando, Kim Hunter, and Karl Malden were all cast in their original Broadway roles. 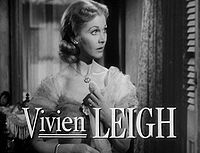 Although Jessica Tandy originated the role of Blanche DuBois on Broadway, Vivien Leigh, who had appeared in the London theatre production, was cast in the film adaptation for her star power. Upon release of the film, Marlon Brando, virtually unknown at the time of the play's casting, rose to prominence as a major Hollywood film star, and received the first of four consecutive Academy Award nominations for Best Actor. The film earned an estimated $4,250,000 at the US and Canadian box office in 1951, making it the fifth biggest hit of the year. In 1999, A Streetcar Named Desire was selected for preservation in the United States National Film Registry by the Library of Congress as being "culturally, historically, or aesthetically significant". Blanche DuBois, a middle-aged high school teacher, travels by train from Auriol, Mississippi to New Orleans. She takes a streetcar named "Desire" to the French Quarter where her sister, Stella, and her husband, Stanley Kowalski, live in a dilapidated tenement apartment. Blanche claims to be on leave from her teaching job due to her nerves and wants to stay with Stella and Stanley. Blanche's demure, refined manner is a stark contrast to Stanley's crude, brutish behavior, making them mutually wary and antagonistic. Stella welcomes having her sister, but Blanche often patronizes and criticizes her. It is revealed that Blanche and Stella's family estate, Belle Reve, was lost to creditors; the sisters are the last remnants of an old and once-wealthy Southern clan. Blanche, widowed at a young age after her husband's suicide, is broke and had nowhere to go except to her sister. When Stanley suspects Blanche may be hiding inheritance money, she shows him paperwork proving the estate was foreclosed on. Stanley, looking for further proof, knocks Blanche's private papers to the floor. Weeping, she gathers them, saying they are poems from her dead husband. Stanley excuses his behavior by explaining he was only looking out for his family, then announces Stella is pregnant. Blanche meets Stanley's friend, Mitch, whose courteous manner is a contrast to Stanley's other pals. Mitch is attracted to Blanche's flirtatious charm, and a romance blossoms. During a poker night with his friends, Stanley explodes in a drunken rage, striking Stella and ending the game; Blanche and Stella flee upstairs to neighbor Eunice's apartment. After his anger subsides, Stanley remorsefully bellows for Stella from the courtyard below. Irresistibly drawn by her physical passion for him, she goes to Stanley, who carries her off to bed. The next morning, Blanche urges Stella to leave Stanley, calling him a sub-human animal. Stella disagrees and wants to stay. As weeks pass into months, tension mounts between Blanche and Stanley. Blanche is hopeful about Mitch, but anxiety and alcoholism have her teetering on mental collapse while anticipating a marriage proposal. Finally, Mitch says they should be together. Meanwhile, Stanley uncovers Blanche's hidden history of mental instability, promiscuity, and being fired for sleeping with an underage student. Stella angrily blames Stanley for derailing her sister's marriage prospects after he exposes Blanche's past to Mitch. Their fight is interrupted when Stella goes into labor. Later, Mitch arrives and confronts Blanche about Stanley's claims. She initially denies everything, then breaks down confessing. She pleads for forgiveness, but Mitch hurt and humiliated, roughly ends the relationship. Later that night, while Stella's labor continues, Stanley returns from the hospital to get some sleep. Blanche, dressed in a tattered old gown, pretends she is departing on a trip with an old admirer. She disdainfully antagonizes Stanley, asserting a sense of superiority, spinning tale after tale about her future plans. He sees she is delusional, but pitilessly seeks to destroy her illusions. They engage in a struggle, after which Blanche is shown in a regressed psychotic state, implying Stanley may have raped her. Weeks later, during another poker game at the Kowalski apartment, Stella and Eunice are packing Blanche's belongings. Blanche, who believes she is going on a vacation, has suffered a complete mental breakdown and is being committed to a mental hospital. Blanche told Stella what happened with Stanley, but Stella disbelieves her. When a doctor and nurse arrive to remove Blanche, she resists and collapses, seized with total confusion. The doctor gently offers Blanche his arm, and she goes willingly. Mitch, present at the poker game, is visibly upset. As the car drives away with Blanche, Stella takes the baby upstairs to Eunice's, ignoring Stanley's calls and vowing not to return. As of November 2018[update], Mickey Kuhn is the last surviving cast member. The play was set entirely at the Kowalski apartment. The film was opened up to include places only briefly mentioned or non-existent in the play, such as the train station, the streets of the French Quarter, the bowling alley, the pier of a dance casino, and the machine factory. Dialogue was abbreviated or cut in some scenes, when Blanche was trying to convince Stella to leave Stanley, for example, or when Mitch confronted Blanche about her past. The name of the town where Blanche was from was changed from the real-life town of Laurel, Mississippi, to the fictional "Auriol, Mississippi". The play's themes were controversial, causing the screenplay to be modified to comply with the Hollywood Production Code. In the original play, Blanche's husband had committed suicide after he was discovered having a homosexual affair. This reference was removed from the film; Blanche says instead that she showed scorn at her husband's sensitive nature, driving him to suicide. At the end of the play, Stella, distraught at Blanche's fate, mutely allows Stanley to console her. In the movie, this is changed to a "Hollywood ending" in which Stella blames Stanley for Blanche's fate, and resolves to leave him. Other scenes were shot but cut after filming was complete to conform to the Production Code and later, to avoid condemnation by the National Legion of Decency. In 1993, after Warner Brothers discovered the censored footage during a routine inventory of archives, several minutes of the censored scenes were restored in an 'original director's version' video re-release. Close tight photography altered the dramatic qualities of the play, for example in the lengthy scenes of escalating conflict between Marlon Brando and Vivien Leigh, or when Karl Malden shines the light on Leigh to see how old she is, or when the camera hovers over Leigh, collapsed on the floor, with her head at the bottom of the screen, as though she were turned upside down. In the movie, Blanche actually rode the streetcar, only mentioned in the play. By the time the film was in production however, the Desire streetcar line had been converted into a bus service, and the production team had to gain permission from the authorities to hire out a streetcar with the "Desire" name on it. The music score, by Alex North, was written in short sets of music that reflected the psychological dynamics of the characters. For his work on the film, North was nominated for an Academy Award for Best Music Score, one of two nominations in that category that year. Upon release, the film drew very high praise. The New York Times critic Bosley Crowther stated that "inner torments are seldom projected with such sensitivity and clarity on the screen" and commending both Vivien Leigh's and Marlon Brando's performances. Film critic Roger Ebert has also expressed praise for the film, calling it a "great ensemble of the movies." The film currently has a 98% rating on Rotten Tomatoes, based on 50 reviews. A Streetcar Named Desire won four awards at the 24th Academy Awards. The film set an Oscar record when it became the first film to win in three acting categories (a feat only since matched by Network). The awards it won were for Actress in a Leading Role (Leigh), Actor in a Supporting Role (Malden), Actress in a Supporting Role (Hunter), and Art Direction. Ten Years After's song "Hard Monkeys" references the movie: "Got no street car called Desire, and I'll never light the fire." In Modern Family episode "Door to Door", Gloria loses Jay's dog Stella. Gloria in a panic asks Cam for help. While searching for the dog, Cam realizes that he is to play the role he was meant to play, screaming Stella just as Stanley did in A Streetcar Named Desire. In Gilmore Girls episode 14 That Damn Donna Reed Rory is given a bird to look after for school which they name Stanley, upon finding out she's a girl rename Stella. When the bird goes missing Lorelai hollers "STELLA" such as in the traditional film. In The Simpsons episode "Secrets of a Successful Marriage", Waylon Smithers has a flashback to his love, with Mr. Burns below his balcony yelling "SMITHERS!" the way Stanley called for Stella. The episode "A Streetcar Named Marge" is centered around a musical remake of A Streetcar Named Desire in which Marge plays Blanche Dubois. Marge's portrayal of Blanche is meant to mirror her relationship with her husband, Homer. In the episode "What Animated Women Want", Milhouse Van Houten adopts Brando's surly attitude and Lisa, after years of rejecting him, finds him irresistible. In The Princess and the Frog, when Naveen and Tiana had turned into frogs and accidentally disrupt a party, "Big Daddy" La Bouff calls for a dog named Stella, in the same manner, to get the frogs. In Over the Hedge, when Tiger the Persian cat is separated from Stella the skunk, who is disguised as a cat, he calls for her as Stanley called for Stella. In Wu-Tang Clan's song "Triumph", Method Man references the movie: "Transform into the Ghost Rider / A six-pack and a streetcar named Desire." In the Rod Stewart / Larry John McNally song "The Motown Song", a line references Stanley Kowalski's remark during one of his poker games in the movie: "'Cause you know what luck is / luck is believing you're lucky". In Panic! at the Disco's song "Memories", they refer to the play: "And it was beautifully depressing, like a street car named Desire. They were fighting for their love that had started growing tired." New Orleans rapper Curren$y references the film in his song "Famous": "this morning staring down at the ocean, inspired, scribbling fire on a streetcar named Desire." In Seinfeld episode "The Pen", Elaine takes too many muscle relaxants and meets a woman named Stella at a function. She screams "Stella" repeatedly during the function. In Saves The Day's song entitled "Hot Times in Delaware", the track starts with an excerpt from the movie's script: "Oh, how pretty the sky is. I oughta go there on a rocket that never comes down. Which way do we go now, Stella, this way? Stella: No, honey this way." In Lana Del Rey's song entitled "Carmen", Blanche's famous line is alluded to: "That's the little story of the girl you know, relying on the kindness of strangers". In Sleeper, a 1973 Woody Allen film, Miles Monroe (Woody Allen) attempts to regain his identity by acting out a scene with Luna Schlosser (Diane Keaton) from A Streetcar Named Desire, with Keaton playing the Stanley Kowalski (Marlon Brando) role and Allen playing Blanche DuBois (Vivien Leigh). In an episode of Malcolm in the Middle, Krelboynes act out scenes from the movie with puppet dolls. In Lil Wayne's song "Let's Start a Fire", he raps "She's riding me like a street car named desire." In the title song to Colin Hay's 2002 album Company of Strangers, a "Blanche DuBois" is invoked as is reliance upon the kindness of strangers. In Bad Religion's album entitled "The New America" a song is titled "A Streetkid Named Desire". The song is an autobiography of sorts that compares the struggles punk rock kids faced in the 70/80's to Blanche's struggles. ^ "A Streetcar Named Desire". American Film Institute. Retrieved July 4, 2017. ^ a b "A Streetcar Named Desire - Box Office Data, DVD and Blu-ray Sales, Movie News, Cast and Crew Information". The Numbers. Retrieved December 15, 2014. ^ Warner Archive Podcast (June 3, 2014). ^ "New Orleans Public Service, Inc. 832". Retrieved November 13, 2011. ^ "The 24th Academy Awards (1952) Nominees and Winners". Academy of Motion Picture Arts and Sciences. Archived from the original on July 6, 2011. Retrieved 2011-08-20. ^ "NY Times: A Streetcar Named Desire". The New York Times. Archived from the original on January 25, 2009. Retrieved 2008-12-19. ^ "Wu-Tang Clan – Triumph Lyrics". Retrieved February 12, 2013. Wikimedia Commons has media related to A Streetcar Named Desire (1951 film).